Leading Exporter of baclofen tablets 10mg, suxamethonium chloride 50mg/ml solution for injection and pancuronium bromide injection 10 mg from Navi Mumbai. Baclofen is a muscle relaxer and an antispastic agent. 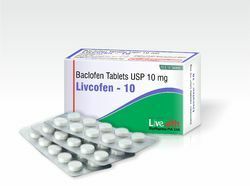 Baclofen is used to treat muscle symptoms caused by multiple sclerosis, including spasm, pain, and stiffness. Baclofen is sometimes used to treat muscle spasms and other symptoms in people with injury or disease of the spinal cord. Packaging Details: 10 x 10 Tablet in a printed carton. 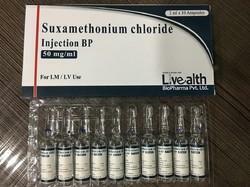 Suxamethonium is a short acting depolarising neuromuscular blocking agent for producing muscular relaxation during anaesthesia. It is used in anaesthesia as a muscle relaxant to facilitate endotracheal intubation, mechanical ventilation and a wide range of surgical and obstetric procedures. It is also used to reduce the intensity of muscle contractions associated with pharmacologically or electrically-induced convulsions. Production Capacity: 150000 Ampoule per day. Packaging Details: 10 Ampoules of 2 ml in a printed carton. Pancuronium bromide injection is a nondepolarizingneuromuscular blocking agent chemically designated asthe aminosteroid 2 β, 16 β-dipiperidino-5 α-androstane-3 α,17-β diol diacetate dimethobromide. The structural formula is:Pancuronium bromide injection is supplied as a sterile, isotonic,nonpyrogenic solution for injection. 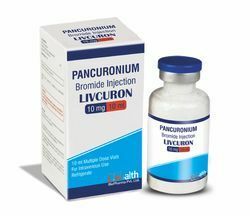 Each mL contains:pancuronium bromide 1 mg or 2 mg; sodium acetate,anhydrous, 2 mg; sodium chloride, 4 mg to make isotonic,benzyl alcohol 10 mg (as preservative); water for injection qs;pH is adjusted with acetic acid and/or sodium hydroxide if necessary. Packaging Details: 10 ml vial in a printed carton.